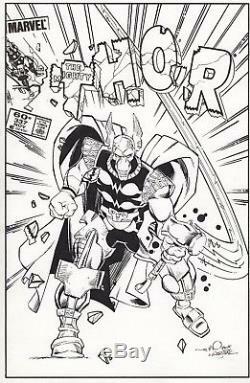 THOR #337 REIMAGINED COVER WALT SIMONSON & CHRIS WOZNIAK ORIGINAL ART. Up for sale is an authentic piece of Original Comic Art. 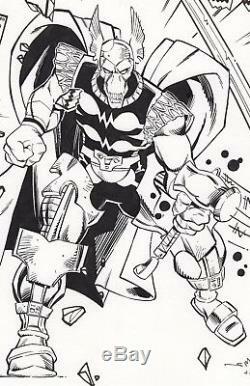 The sketch was drawn by industry superstar Walt Simonson with compositing and finishing Inks done by Marvel and DC Comics Artist Chris Wozniak. The live art area for this piece is 10X15 inches (standard size for Bronze Age Comic Art). HOW COMIC ART IS MADE: Much of the Comic Art from the Silver and Bronze Age of Comics was created by an Inker working with a brush or crow quill directly onto the Penciled page, reinterpreting the Penciled art in his own Inking style to make it suitable for production. All of the Penciler's marks are then completely removed from the art board and we are left with the Inker's interpretation, or what is better known today as Original Comic Art. But many of Marvel's most iconic covers from the Silver and Bronze Age were actually created on a lightbox where the Penciled art is taped under a clean board and the Inker reinterprets the art onto the top page. This tried and true method is a huge part of Marvel's history. THE MARVEL HOUSE STYLE: The most famous user of the lightbox technique would undoubtedly be JOHN ROMITA, who was hired by STAN LEE to serve as Marvel's Art Director throughout most of the Silver and Bronze Age. Romita was tasked by Stan be the official keeper of the Marvel House Style for decades. Many times when ROMITA was given Penciled art or layouts from someone like the legendary GIL KANE for instance, that art needed adjustments or re-sizing, so Romita would finish the art using this well tested Marvel method before signing Kane's and his own name to it. The covers produced in this manner are some of the greatest, most sought after covers in the history of comics. They sell for hundreds of thousands of dollars and frequently hang in museums. Though Kane never physically handled those art boards they are rightly considered by Marvel, by Kane, by Romita, by Art Dealers and Comic Art Collectors around the world to be genuine Gil Kane originals. Original Comic Art has been produced in this manner since the earliest days of Marvel. This was standard Marvel practice under Stan Lee's explicit direction. That is how this piece was produced. It is not a copy. It is not a reproduction. It is not a tracing. It is not a recreation. It is not made with markers or modern tools. It is not blue line inks. A skillfully hand-crafted one of a kind piece of Original Comic Art made with the same time honored Marvel techniques that John Romita used to produced countless examples of priceless Silver and Bronze Age Comic Book Art. ABOUT THE ARTISTS: Walt Simonson is one of the greatest of the Bronze Age. His groundbreaking work on Thor made him a superstar in the business. Chris Wozniak is a Bronze Age Penciler and Inker. He has used this same time honored Marvel method since 1985 to produce many works for Marvel and DC Comics. The item "THOR #337 REIMAGINED COVER, Walt Simonson & Chris Wozniak original comic art" is in sale since Thursday, May 17, 2018. This item is in the category "Collectibles\Comics\Original Comic Art\Covers". The seller is "metrognomemedia" and is located in Lancaster, New Hampshire. This item can be shipped to United States, Canada, United Kingdom, Denmark, Romania, Slovakia, Bulgaria, Czech republic, Finland, Hungary, Latvia, Lithuania, Malta, Estonia, Australia, Greece, Portugal, Cyprus, Slovenia, Japan, China, Sweden, South Korea, Indonesia, Taiwan, South africa, Thailand, Belgium, France, Hong Kong, Ireland, Netherlands, Poland, Spain, Italy, Germany, Austria, Israel, Mexico, New Zealand, Philippines, Singapore, Switzerland, Norway, Saudi arabia, Ukraine, United arab emirates, Qatar, Kuwait, Bahrain, Croatia, Malaysia, Brazil, Chile, Colombia, Costa rica, Panama, Trinidad and tobago, Guatemala, Honduras, Jamaica.